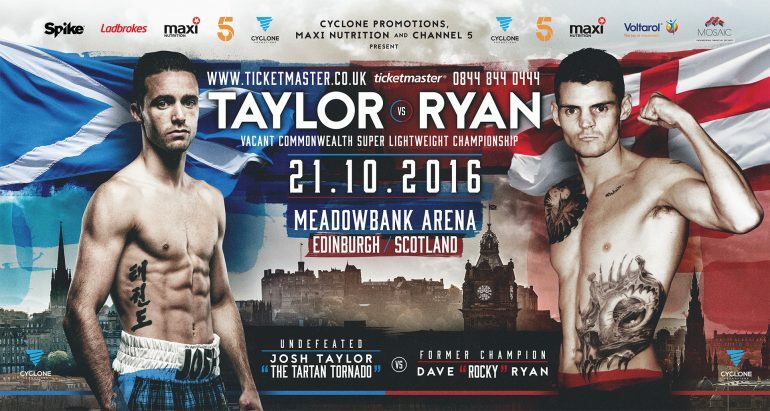 Edinburgh, SCOTLAND – Unbeaten super lightweight prospect Josh Taylor took a big step toward contender status by thrashing Dave Ryan inside five rounds at the Meadowbank Sports Centre on Friday, picking up the vacant Commonwealth title in the process. 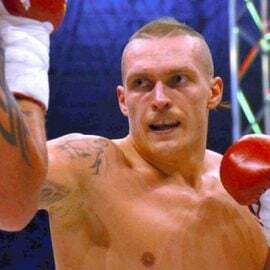 Taylor, a decorated amateur star who represented Team GB at the Olympics in London 2012, scored a quick knockdown in the third and a terrific right hook to the body dropped Ryan again in the fifth. Following a brutal follow-up assault, referee Michael Alexander stopped the contest at 2:45 of the round. “I’m on cloud nine,” said Taylor (7-0, 7 KOs) after claiming his first title as a professional. 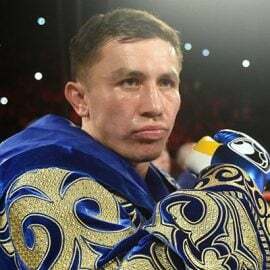 “It’s not sunk in yet because this was only my seventh fight. I was expected to win and there was a bit of pressure but I ended up enjoying myself. Taylor was impressive defensively and was crossing over the left hand out of the southpaw stance very early. Adept as a switch-hitter, there were times when Ryan simply didn’t know where the next attack was coming from and he struggled to match the home fighter in terms of speed and skill. The visitor did have moderate success but was paid back in full with a solid body assault, which became a staple of Taylor’s offense. 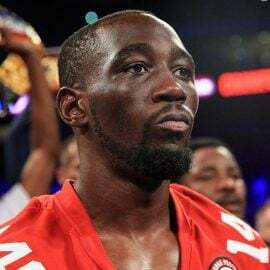 A big left to the midsection set up a left hand to the head for the first knockdown and Ryan’s right eye was badly swollen following Round 3. Another huge left to the body doubled Ryan in two as the bell rang to end the fourth and there was no way the Englishman could take much more. 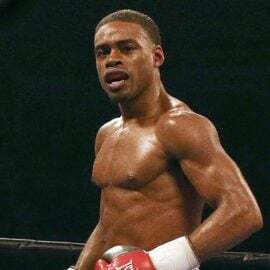 The right hand body shot, which dropped Ryan in the fifth, effectively ended the contest and only his tremendous heart got him off the canvas. The stoppage was merciful. This was the biggest and most eye-catching victory of Taylor’s career to date, made even more impressive by the fact that he only entered the paid ranks in July of last year. This was actually the first time the Scotsman had been extended beyond the second round. It was a move worth making, however, as the Scotsman turned in a scintillating performance on home ground. 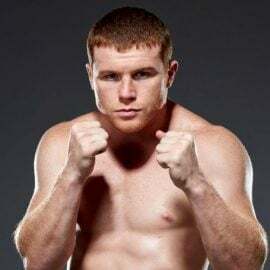 A feverish Edinburgh crowd echoed home every punch and Taylor also had world-class back up in the form of WBA featherweight titleholder Carl Frampton, former cruiserweight and heavyweight titleholder David Haye and three-time world title challenger George Groves, who are stablemates. 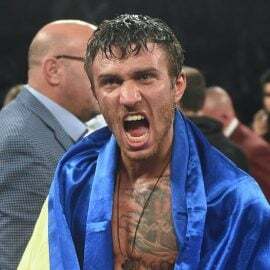 The bout was televised on terrestrial television (Channel 5) in the U.K.
Tom Gray is a U.K. correspondent/ editor for RingTV.com and a member of THE RING ratings panel. Follow him on Twitter @Tom_Gray_Boxing. 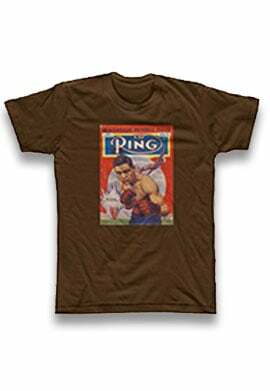 You can subscribe to the print and digital editions of RING magazine by clicking the banner or here. You can also order the current issue, which is on newsstands, or back issues from our subscribe page. 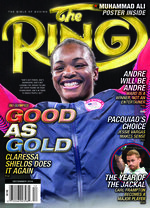 On the cover this month: Double Olympic gold medalist Claressa Shields. The U.K. Issue featuring cover star Carl Frampton will be available soon.